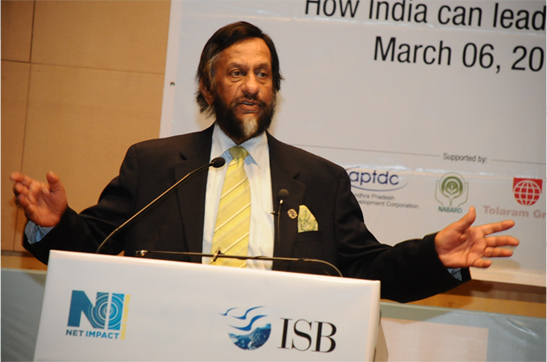 Dr R K Pachauri was at the Indian School of Business (ISB) recently to preside over a symposium, “Climate Change and Sustainability.” He interacted with the students as part of the festivities surrounding the Global Social Venture Competition (Asia-Africa). Assistant Professor Gireesh Shrimali moderated the interaction. There are considerable uncertainties about climate change with widespread agreement among scientists but disagreement among the public. How can this difference be bridged? I think the only answer lies in informing the public about the reality of climate change. The fact is that there many with vested interests who would like to sow doubt in people’s minds. There is a very interesting Washington DC-based think tank, Center for Public Integrity and they have published on their Web site that there are 2340 lobbyists in Washington whose job is to see that there is no legislation to deal with climate change. They are funded by 770 companies. So, may I say that they have been rather successful in casting doubts on the scientific validity of climate change? The graph shows that climate change or global warming is happening and the graph was invented two hundred years ago. The question is how certain can we be based on evidence that is just over the last two hundred years? I think what we have today is not just an impact. If I had the graph, I could show it to you. Some of you may have seen the movie “An Inconvenient Truth” and in that you would remember that Al Gore was showing this graph of temperatures over the last ten thousand years. To show the dramatic increase, he stood on an elevator and went all the way to the top of that graph. So, if you look at the historical record the increase that is taking place in recent times is completely out of sync with what we have heard historically. Now to answer this question another way, we have extremely reliable climate models today in which the inputs which drive the model are both natural activities, zonal activities, volcanoes and human activities which are essentially an increase of concentration of greenhouse gases. Now, when you run these models and run them for a historical period of time you can easily identify changes that were caused by natural forces and those that were human induced. So, I think science has now reached a level where you are able to more or less get identical results to what happened in the past on the basis of these model runs. So the evidence is very, very strong and actually that is why we use the term that warming of the climate system is unequivocal, there really is no room for scientific graphing on this particular issue. The evidence is very strong that the warming of the climate system is unequivocal. I want to talk about the negotiations around the world regarding climate change and the widespread belief that the developed world has caused this problem and they are asking the developing world to take part in that. There seems to be a stalemate due to that. How will negotiations develop in the future? How can we arrive at solutions that will benefit the whole world? I am reaching the conclusion that while it would be great to get a global agreement by which India meets this challenge I think in the ultimate analysis we now need much greater effort than the local work. And I think every country and every society, every city and every state must now take the initiative because negotiations have gone on much too long without reaching any degree of congruence in what needs to be done. We are making headway at a very, very slow pace and therefore I would say that what would really support these negotiations is action at the local level. We need to create awareness. Businesses must remember that the world is moving toward a low carbon future. Those industries, those investors who will ensure lower emissions from technologies, products and processes will get a larger market share. I think industry in this country also has to look at that reality. I think every country and every society, every city and every state must now take the initiative because negotiations have gone on much too long without reaching any degree of congruence in what needs to be done. The view is that India’s main concern now is poverty alleviation followed by growth phase. Many believe that green growth is an oxymoron. Do you believe that India can grow sustainably while being an environmental leader and if so, what are the possible implications? If we believe that 400 million people who don’t have electricity today will get it tomorrow we are really fooling ourselves. There will be no electricity for three generations. Even if they get it, it will be too unreliable to be useful. But, here is mobile phone, this makes it possible not only to generate employment but transform the lives of those in rural areas who will otherwise never see the benefit of modern forms of energy. This argument can be carried further. We could use renewable energy for setting up rural chains for cold storage facilities which would enhance the lives of people in rural areas substantially. So, not only is there no conflict between growth and protecting the environment, there is a very close congruence between them. And you can generate employment in sectors that we have not seen so far by following this approach. And therefore I really think that we need to disseminate information about these opportunities. So that small entrepreneurs, small businessmen can start getting involved in these solutions. The global market for renewable energy will grow very rapidly and with our abundant sunshine, we are in a unique position to take advantage of that renewable energy. What is the best form of energy source? Should India depend on coal, because it is the cheapest? Or should we focus on expensive technology like solar energy and nuclear energy? Well, it is a myth that India has unlimited mineable resources of coal. We are already importing about 100 million tonnes. Our research indicates by 2031, India will be importing 1300 billion tonnes of coal and about 750 million tonnes of oil. So, coal is no longer an unlimited option. Most of the coal we have available today is in locations where mining is going to be extremely difficult. Initially, solar energy on a large scale will be more expensive, but with right policies, we can bring down the costs so as to compete effectively. Because there are large parts of this country where insulation levels are so high and in some areas land is not a constraint, we can use solar power on a substantial scale. In case of nuclear energy, I am afraid we are not doing it right. If we want a quantum jump in nuclear power generation I really think we have to involve the private sector and get technology from Japan, France, and North America. But, I think we really have to move on now to nuclear. Of course there are some issues of fuel supply but I think they can get solved. want to talk about another related topic which is highly relevant to India – organisation. India is moving towards rapid organisation. While, this economic outcome is claimed to be more environmentally sustainable in terms of living areas for the planet, what are your views on organisation as a solution to the environmental problem? I personally think this move towards smaller, planned cities is a very good one. They are planning that along the Delhi-Mumbai corridor. I think that is a very good concept because this gives you an opportunity to start with urban development from scratch and do it in a manner that is completely sustainable. But what is particularly important is to provide facilities to create capacities in rural areas whereby you can generate employment so that people are not forced to move to cities. Today, a lot of people go simply because they have no employment opportunities in the village. If one made a rational choice I can understand but otherwise I am afraid urbanization would be equivalent to growth of slums and that is certainly not the best way to promote the welfare of this country. What are the business opportunities – you talked about the opportunities in the rural areas – but overall in the Indian economy what are the interesting opportunities for doing businesses in the renewable energy area and in other areas of the environment. I think the opportunities are immense. Even for something like managing water resources, recycling of processed water, recycling of waste, if one takes a view of what will happen in the next ten years these are areas where regulations, public pressure and legislations will make it essential for companies to adopt sustainable energy practices. So, I think if there is a company in these areas today they would have enormous, unlimited opportunities in the future. There is also need to innovate. The global market for renewable energy will grow very rapidly and with our abundant sunshine, we are in a unique position to take advantage of that renewable energy. 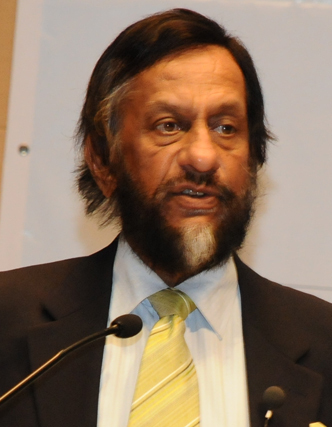 Could you talk briefly about the role of the Indian government in promoting renewable energy? What is the government doing to help businesses become more successful? To be quite honest, I am really disappointed with the way the government of India has dealt with renewable energy. The department of Unconventional Energy Sources was set up in 1982. So we have had almost thirty years of experience with a separate department and then a ministry dealing with renewable energy. But I am afraid they have lost this opportunity. In this period if they had taken a more enlightened approach they would have had focused research in health and funding and we would have had a solid base in renewable energy supply. Now I am hoping that belatedly with the government’s solar energy mission, we might be able to get the right structure for dealing with renewable energy. The industry will have to play a predominant role. Because unless industry is involved I don’t think we will get any solutions that make market sense. This question is related to the Kuznets curve (The curve is the graphical representation of Simon Kuznet’s hypothesis that economic inequality increases over time while a country is developing, and then after a certain average income is attained, inequality begins to decrease). You mentioned the need for the developing countries to tunnel through the curve but they may not have the resources to do so. Is there a model being worked out where the developed countries will provide funds to engage the developing countries in technologies that will help them tunnel through the curve? Unfortunately, there is absolutely no evidence of developed countries realizing their responsibility in bringing this along. Some European countries and Japan are certainly focusing on overseas development assistance in this area, to a small extent, but nothing that can really make a difference. Ultimately, it is left to us Indians to realize the benefits of moving in this direction ourselves. And then realizing that the cost of damaging the environment is so much higher than the cost of using the right technologies, using the right development strategies, that we better adopt ‘a’ versus ‘b’ because if we don’t adopt renewable energy technologies, then I think the cost of damage to the environment and the depletion of our natural resources, including forests will become unbearable over a period of time. So even in sheer economic terms it makes sense for India to go along this kind of opportunity. But to be quite honest, I don’t see too many signs of that. If we don’t adopt renewable energy technologies, then I think the cost of damage to the environment and the depletion of our natural resources, including forests will become unbearable over a period of time. Climate change is viewed as a moral problem since it will impact the future generations more but we are asked to fix the problem. What is the cost of fixing the problem versus the benefit for future generations? While the Stern Review on the Economics of Climate Change used a very low discount rate, other economists have used high discount rates. How should we fix the problem using the appropriate discount rates? I think you may concede the important issue and frankly, I am glad you have done so because I personally believe that even in a business school setting, most importantly in a business school setting, I think there has been overriding adherence to certain ethics and these ethics transcend mere financial calculations. Because if you look at growth, what has happened in Wall Street and several board rooms in the United States, I think they focus so much on just the simple financial returns in the next quarter that they have completely lost sight of the longer term benefits to an organisation, society and the responsibility of corporations to society. Equity, both inter-generation and intra- generation, cannot be calculated on the basis of discount rates and the present value of future streams of income and expenditure because there is undoubtedly an ethical dimension that is very different from the economic dimension. But as human beings, we are supposed to rise above these purely carnal benefits, and we have to contribute to the sustainability of civilization and human society. I think we go back to the definition of sustainable development; anything that compromises on the ability of future generations to meet their own needs defeats this very cardinal principle of promoting sustainable development. So my own view would be that particularly in a business school where your decisions are going to make such a fundamental difference to a whole range of economic activities, the overriding emphasis on ethics is something that you cannot possibly ignore. I think if you kept this in mind then you will see financial calculations and computations in a very different light from what a narrow and myopic view would perhaps take you to. So this is something that cannot really be justified on the basis of typical financial analysis. It goes far beyond that and I certainly hope that the students of this remarkable institution will keep that ethical dimension in everything that they do throughout their lives.